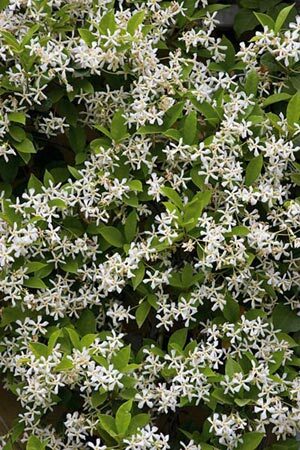 Confederate Jasmine (Trachelospermum jasminoides), also known as Star Jasmine, is a native of China and is very popular in southern United States zones 7-11. The flowers are small one inch diameter white pinwheels with slightly crimped edges and they offer a wonderful scent. This vine is a vigorous grower reaching heights of up to forty feet, with twenty feet being the norm. With its twining habit, it's easily trained on trellises or walls, or espaliered over doorways. It is also used as a ground cover. It does well in full sun or part shade, blooming from spring to early summer. It is drought tolerant, but not salt tolerant. Propagation is made from cuttings or air layering.